+2 Dexterity, +2 Charisma, -2 Strength: Arkaedraeks are lithe and personable, however their bodies lack muscle mass. Medium: Arkaedraeks are medium sized creatures and have no bonuses or penalties based on their size. Low-Light Vision: Arkaedraeks can see twice as far as a human in conditions of low light. Scales: While not completely clad in scales, enough exist on the skin of an Arkaedraek to provide a +1 bonus to Natural Armor. Disease Resistant: Arkaedraeks do not get sick easily, gaining a +2 racial bonus on Fortitude saves against disease. Dilettante: Arkaedraeks are born with a predilection for the arts. They gain a +2 racial bonus on any one Perform skill. Perform is always a class skill for arkaedraeks. Empathic: Arkaedraeks can easily sense the emotional state of others, gaining a +2 racial bonus on Diplomacy and Sense Motive. These skills are always considered class-skills. 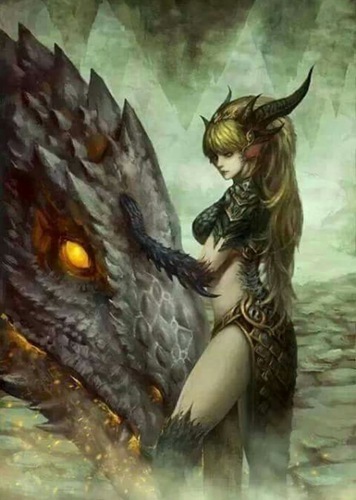 Draconic Lineage: Arkadraeks are related to terrestrial dragons and as such they are resistant to certain energy types based on their bloodline. Gold/Red: Fire Resistance 5, Black/Bronze: Acid Resistance 5, Blue/Copper: Electricity Resistance 5, White/Silver: Cold Resistance 5. Touched Soul:Arkadraeks related to Gold, Bronze, Copper or Silver Dragons are considered to be Light Aligned. Arkadraeks related to Red, Black, Blue or White dragons are considered to be Shadow Aligned. Chosen class may change this alignment. Draconic Sorcery: Arkaedraek sorcerers with the draconic bloodline count their Charisma score as 2 points higher for all sorcerer class abilities. Languages: Arkaedraeks speak common and Draconic. Arkaedraeks with a high Intelligence score may choose bonus languages from the following list: Aquan, Ignan, Terran, Auran, Orc, Goblin and Giant.